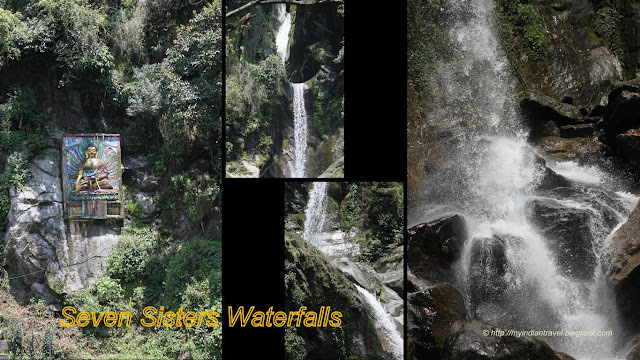 On our way to Lachen in North Sikkim from Gangtok we came across beautiful scenes and water falls. One such water fall just 32 kms away is Seven Sisters Waterfalls. There are quite a few waterfalls on the way and this is a place where one has to break to savour the pristine beauty and to be with nature. This lovely falls is named so because it can be seen that water in the waterfall falls cascades in seven stages. This serene waterfall can be seen in three distinct tiers. One can climb a few steps gives a beautiful view of the waterfall in the upper stages. This is a ideal place for break up for the tourists travelling to North Sikkim. What a fantastic waterfall, and you got some excellent photos. One of our local waterfalls is called Seven Falls, for the same reason. There are some truly beautiful places in the world, thank you for sharing the Seven Sisters with MM this week. Such beautiful view of the waterfall, a place to be in nature, indeed! So lovely aspects captured and so well presented in collages! It must be lovely to have a walk and see this beauty of nature! Have a great neew week ahead! A lovely waterfall, and nice photos. Lovely photos of the waterfall. Happy mosaic Monday to you! What a stunning waterfall. Is that a Buddha or someone else? I can go through very difficult situations just to see beautiful waterfalls. It would be a lovely waterfalls for long exposures. What lovely shots of the falls. Beautiful waterfall. I love to watch from afar but not too near. Lovely capture and I can almost hear the water gushing down. Those seven sisters are an impressive waterfall indeed. And am I right in thinking this isn't even in the midst of the heaviest rainfall? Wow! Very impressive waterfall and captured beautifully. This is very lovely! I enjoy waterfalls a lot. I do not think I have ever seen a 7 tier one. Beautiful falls, I vaguely remember about my visit to this place about 10years back. an amazing place indeed. Loved to see it! Thanks!